A mix of medieval streets and modern boulevards, Rouen has an up-to-date and highly useful public transport system—yet you can walk to most sights. Rouen, 132 km (82 miles) northwest of Paris, and 91 km (57 miles) east of Le Havre, has a confusing medieval street layout, with curves, hills, and a loop of the River Seine (map). It can be confusing at first, but you'll get the idea soon. City transport is by tram, Metro, city buses, rental bicycles (Cy'clic, like Paris's Velib'). The central nexus for city transport is the Théatre des Arts stop at the corner of avenue Jeanne d'Arc and rue Général Giraud. The terminal for Keolis Eure regional buses is here as well. The wonderful Art Nouveau/Art Deco Gare de Rouen Rive-Droit SNCF is 1 km (6/10 mile) northwest of the city center up the hill on rue Jeanne d'Arc. 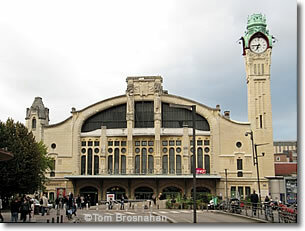 It still serves trains from Paris (Gare St-Lazare) as it has for nearly a century. Rouen's Gare Routière (intercity bus terminal) is right next door. City buses and taxis are available here as well. The small Aéroport Rouen Vallée de Seine serves general aviation (ie, small private planes) and a few tourist flights.